Nowhere does it say that Hot, Cheap & Easy means low-fat, low-carb or low-cholesterol. As it happens, a lot of what I prepare and eat is on the lighter, greener, and grainier side, but I am never averse to bacon and eggs; in fact, sometimes I feel that they are the only possible answer. Bacon and eggs for dinner? Yeah. Bacon and eggs and pasta for dinner? Double yeah. Bacon and eggs and pasta and cheese for dinner? Bring It On. Thus spaghetti alla carbonara, a dish from Rome that shows once again, no matter the state of their government, economy or traffic, no one can as consistently make as many people happy with food as effortlessly as the Italians. Leandro and I threw this dish together in less than 20 minutes. He is getting very handy with the egg-cracking and beating and whether it was pride in his own handiwork, or just the ineffable joy of bacon grease and cheese, he made short work of two heaping bowls of it. We will be doing this on our next camping trip; I may try to make it a one-pot affair and will keep you posted! Heat the oil and butter in a skillet; add the bacon and sauté until golden and crisping up. Remove from fat and drain on paper towels. Cook the pasta according to package directions. Make sure you have the next step completed before that pasta is cooked so the pasta is piping hot when you turn it into the bowl. While the pasta is cooking, beat the eggs, ¼ Cup of the grated cheese, and pepper in a large serving bowl. As soon as you drain the pasta, turn it into the bowl and toss well. (If you are worried that the egg hasn’t cooked enough, return it to the pasta pot and stir it around over the still warm burner or a low flame for a minute or two). Add the remaining cheese and serve. *To make sure eggs are fresh, place them in a bowl of water to cover. A very fresh egg will stay completely submerged. A relatively fresh egg will float up on one end, while the other end remains on the bottom. An egg that floats is an egg that is rotten. ← Which Valentine’s Day Dinner Would You Choose? Note to Readers: I noticed that this recipe is being hunted down today by many. And for good reason; what a perfect solution to a chilly, lazy snow day? 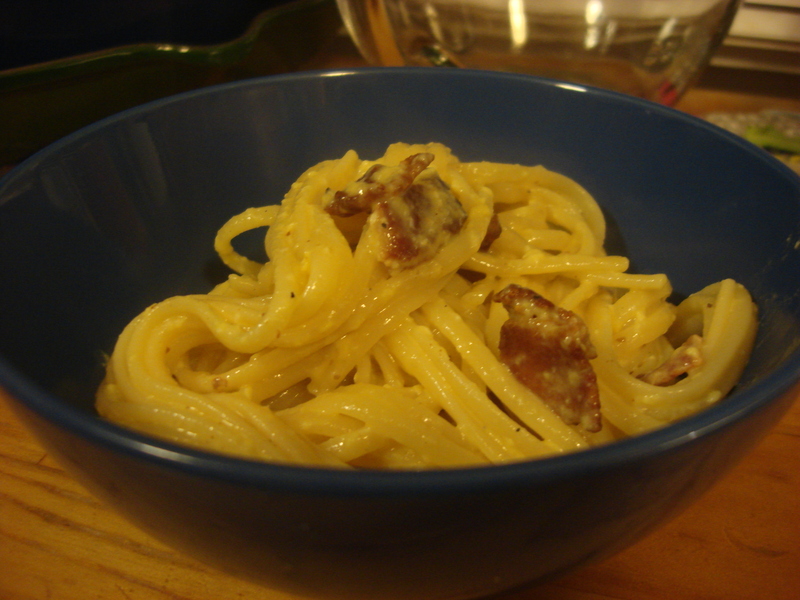 This is one of my favorite Italian dishes and so easy to make. Thanks for reminding me that I haven’t had this in a long time and I need to prepare it soon. pasta, you might choose the whole wheat version so as to transform your spaghetti alla carbonara recipe into a healthier dish….. Thanks for the tips, Lorraine! We eat a lot of whole grain pasta, but this is a recipe that I don’t think would be right with it. I will look for better bacon…to go with the better beef and chicken we have already found! I agree 100% this meal calls for white pasta. I can’t wait to cook it up. Hhmmm snow storm Pasta? mmm-mmmm. I’m going to defrost some bacon now! I love bacon and eggs for dinner. This looks even better. My Italian side is saying Yes! 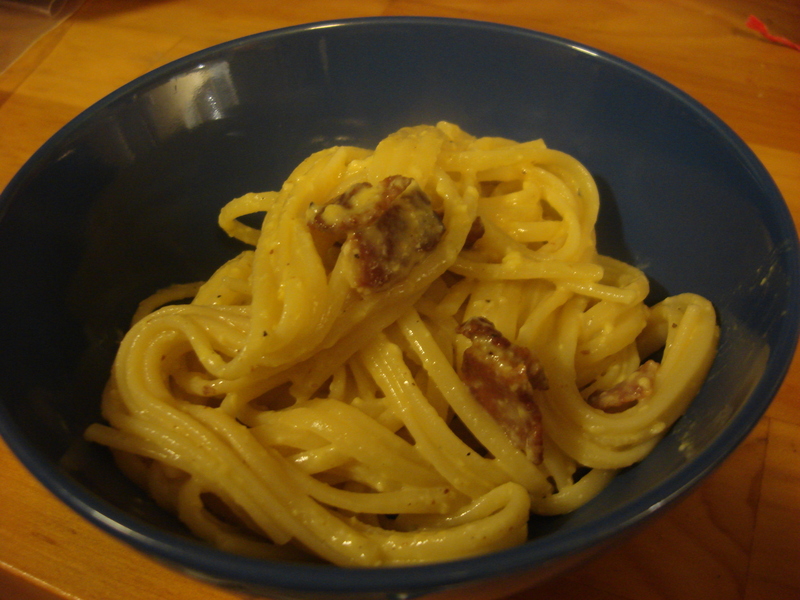 It is a Hot, Cheap and extremely easy way to prepare this Italian Classic, Natalia.